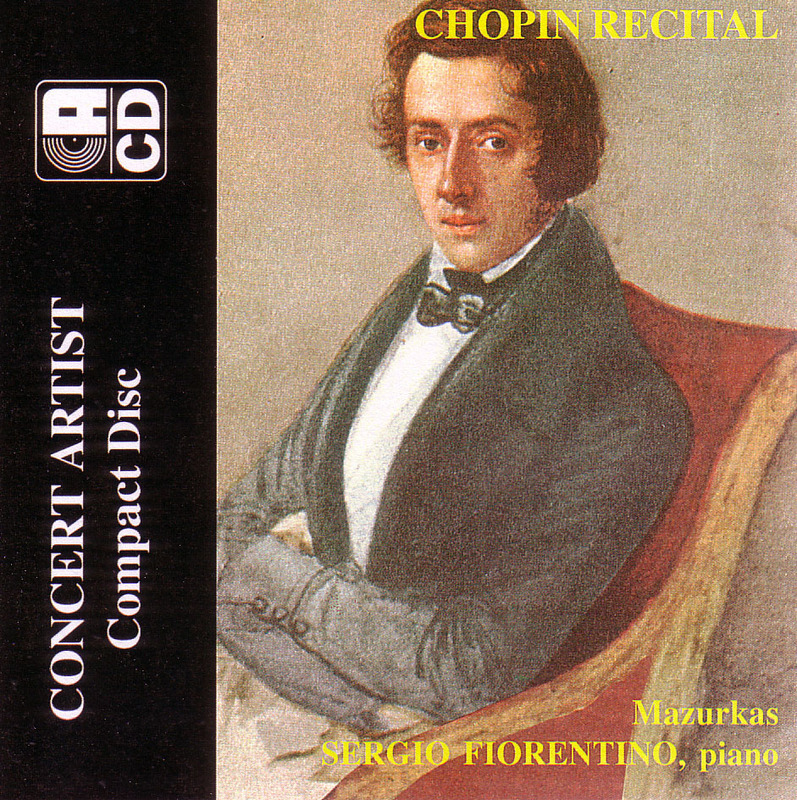 Performances by several pianists have been uncovered on a compact disc of Frederic Chopin mazurkas attributed to Sergio Fiorentino which was published in 2003 by Concert Artist Recordings. Concert Artist has become well known for producing a large number of CDs supposedly performed by Joyce Hatto but which were later found actually to be doctored copies of commercial releases by many other pianists. This is the first case in which recordings by performers other than Joyce Hatto on the Concert Artist label have been found to be misattibuted. 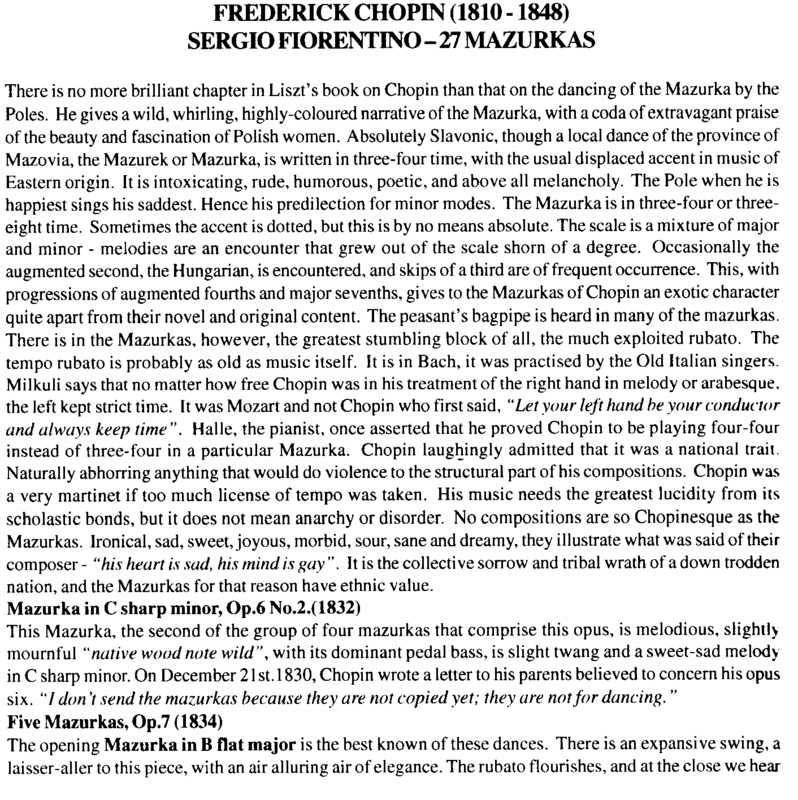 The discovery was first made at the AHRC Research Centre for the History and Analysis of Recorded Music (CHARM) at Royal Holloway, University of London during progress on historical performance analysis in mazurkas composed by Chopin. 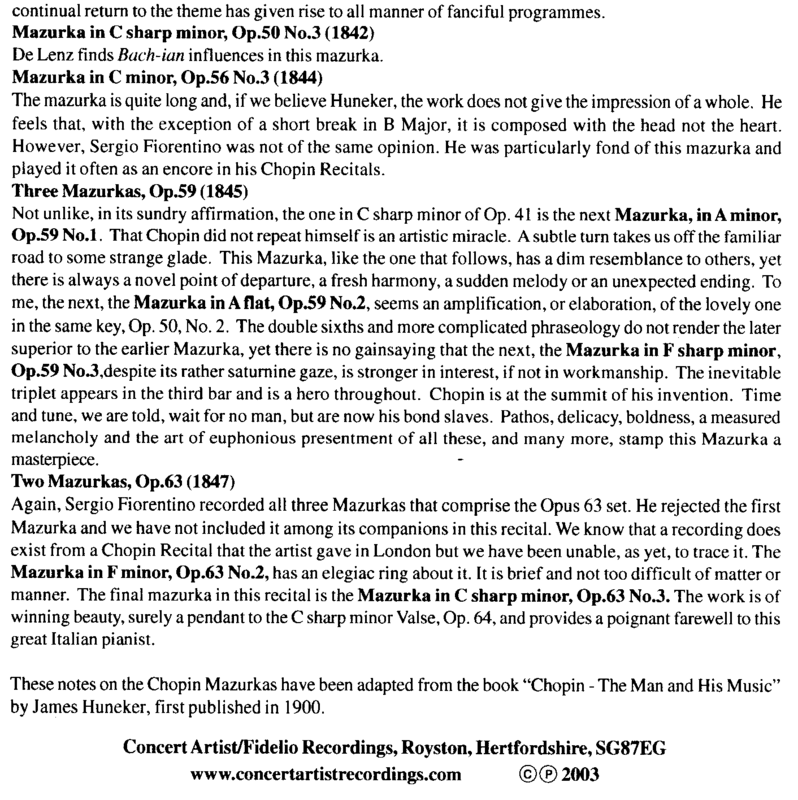 Fiorentino's performance of Mazurka in A minor, Op. 7, No. 4 (Concert Artist CD 9200-2) was found to be identical to that of the Polish pianist Janusz Olejniczak on the Naive/OPUS 111 label (OP20002), released in 1991. Comparing audio waveforms between the two CDs uncovered five additional tracks on the Fiorentino CD which were actually released earlier by Olejniczak on Opus 20002. 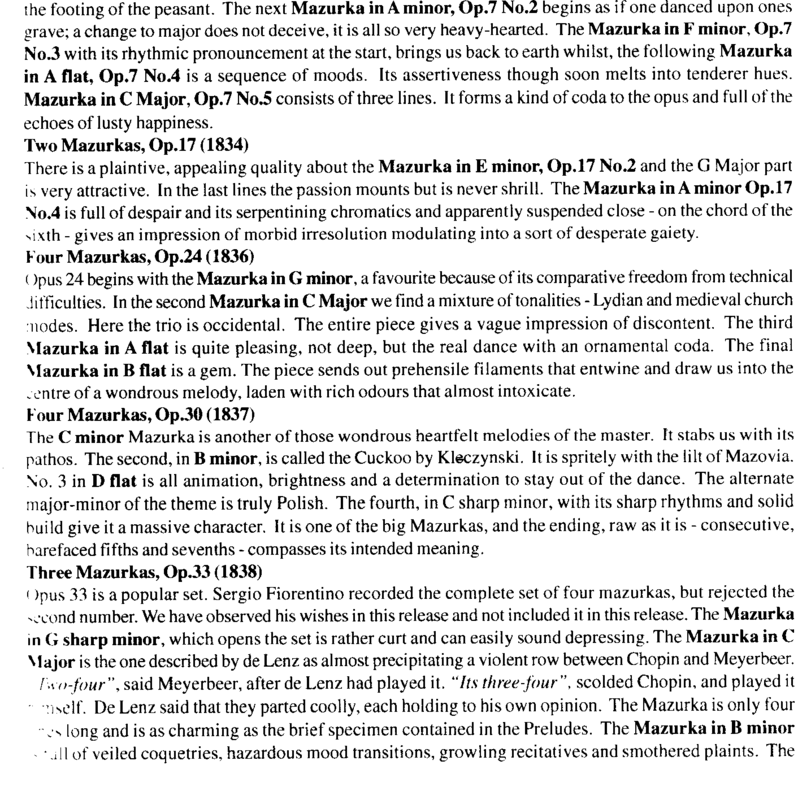 Audio researchers working on the Online Music Recognition and Searching II (OMRAS2) project at Goldsmiths College, University of London were then enlisted to further examine other tracks on the Fiorentino mazurka CD. 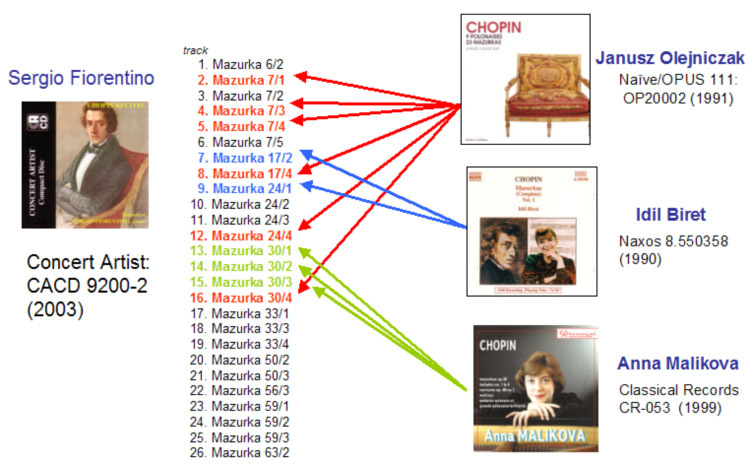 Using their freely-available audio database software called audioDB, two additional performers were identified on the Fiorentino CD: two tracks by the Turkish pianist Idil Biret (Naxos 8.550358; 1990), and three tracks by the Russian pianist Anna Malikova (Classical Records CR-053; 1999). Interestingly, both of these pianists are also found in the set of recordings attributed to Joyce Hatto (view a list of Hatto ghost performers compiled by Farhan Malik). According to the liner notes on the Concert Artist CD, the Fiorentino performances were "recorded at various venues, Hamburg, Paris, London, Hornsey, Greenwich & Guilford during the period July 1958 to February 1966." 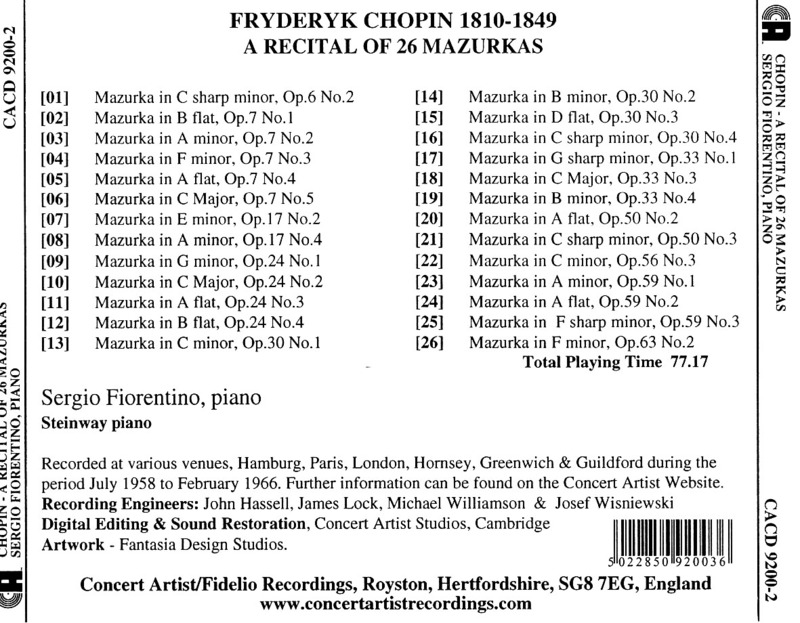 However, the eleven tracks from the three unattributed pianists were all recorded digitally in the 1990's, and the quality of these recordings are degraded so that they appear to be recordings from the early 1960's. 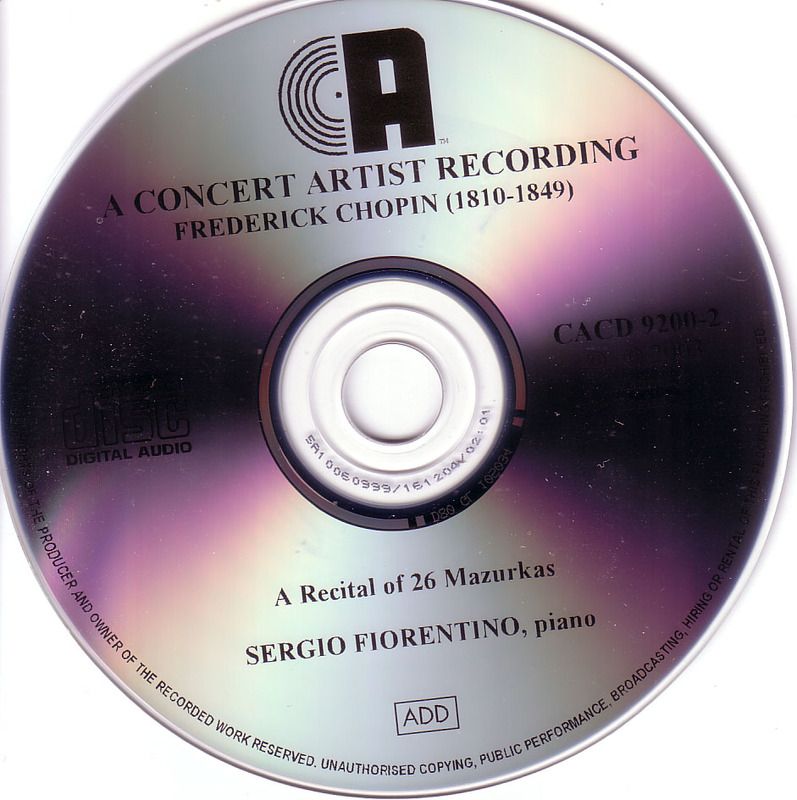 Of the remaining 15 tracks on the CD, it is uncertain whether they are authentic Fiorentino performances or yet more recordings of unattributed pianists. It might not end there. Ernst Lumpe was producer and discographer of the late Italian pianist Sergio Fiorentino, who was signed for a time to the Concert Artist label. After Fiorentino's death in 1998, Barrington-Coupe claimed to possess a number of previously undiscovered Fiorentino recordings. He released them on the Concert Artist label. "I have certain doubts with some of them," says Lumpe. "One in particular is most likely not played by Fiorentino." Combined -- First channel contains Malikova Recording, second channel contains Fiorentino recording.